The manner of their attire and painting them selves ..., a watercolour, painted by John White circa 1585-93. ©Copyright The British Museum. The fate of the cimarrons in early Virginia forms a tantalizing part of a famous American mystery. When the Africans reached Roanoke in 1586, they joined a military colony in chaos. Under the leadership of Ralph Lane, Roanoke suffered from a shortage of labor, a preponderance of soldiers, internal strife, and very poor relations with the Native Americans. A frustrated Lane left the colony in 1586 with almost all of his followers. After Lane left, what became of the slaves and Indians? "The saddest part of the story, and perhaps the most revealing," writes historian Edmund S. Morgan, "is that no one bothered to say." The fate of Drake's cimarrons was never recorded. David B. Quinn, who wrote the definitive account of the history of the lost colony, contends that the cimarrons probably did not return to England with Lane. The influx of such a large community of free blacks would surely have been remarked upon in England, argues Quinn, yet no such account exists. Quinn and other scholars concur that the cimarrons were probably left at or near Roanoke in 1586. From that point on, all is mystery. Did they meet up with the members of John White's famous "lost colony," who reached Roanoke in 1587, after Lane had departed? Again the historical record leaves few clues. White himself wrote nothing of the cimarrons, but he also left Roanoke just ten days after arriving. Making a supply run back to England, he left behind his pregnant daughter, her husband, and 114 colonists. Due to the Spanish Armada and a few other circumstances beyond his control, White was not able to return to Roanoke until 1590. When he finally arrived, he found a fortified but deserted island with only the word "Croatan" carved onto a tree. Historians and fantasists have speculated endlessly about the significance of "Croatan," but White had no doubt about its meaning: the inscription was a pre-arranged signal that the colonists had resettled with friendly Croatan Indians. Before leaving in 1587, White had asked the colonists to carve such a message and to add a cross if they were forced to leave under duress; finding no cross, he was confident that they had left in safety. Unfortunately, neither White nor other explorers were ever able to find the colonists. 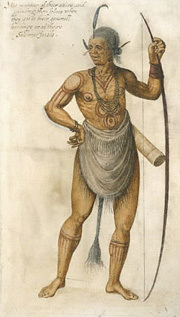 Through the 1600s and 1700s, however, explorers heard rumors of and eventually met a community of seemingly mixed-blood Indians, among whom were gray-eyed members with Anglo traits. Some were able to read and, according to some reports, speak Elizabethan English. Traditions in Carolina have long traced the present-day Lumbee Indians to both the Croatan Indians and the English descendants of White's "lost colony." Traditionally, the Lumbee / Croatan Indians do not trace their lineage to early Africans, though observers have since the 1800s noted a confluence of Anglo Saxon and African American traits among the Indians. Of course a number of factors could account for this, including misperception and racism. The Lumbees have a history of adamantly denying black ancestry. This too may relate as much to larger identity issues in America as to any other factors. Whether or not Drake's cimarrons died in the wilderness, found a home with John White's lost colonists, or became members of the Croatan community, their history adds to the probability that a number of Africans took up residence in America long before 1605. That was the year that the British established Jamestown, the first permanent English settlement in the New World, and the launching point for many a white American myth. One can imagine equally fascinating myths about the cimarrons, torn from their homes in Africa, finding freedom on the shores of a New World.